An ice pack or gel pack is a portable plastic sac filled with water, or refrigerant gel or liquid. For use the contents are frozen in a freezer. Both ice and other non-toxic refrigerants (mostly water) can absorb a considerable amount of heat before they warm above 0 °C, due to the high latent heat of fusion of water. These packs are commonly used to keep food cool in portable coolers, or as a cold compress to alleviate the pain of minor injuries; or in insulated shipping containers to keep products cool during transport. The ice pack is very useful in treating acute sprains, acute bursitis, acute joint inflammation, and bruises. It should be applied as soon after the injury as possible. It contracts the blood vessels, keeps the swelling to a minimum, and relieves pain. 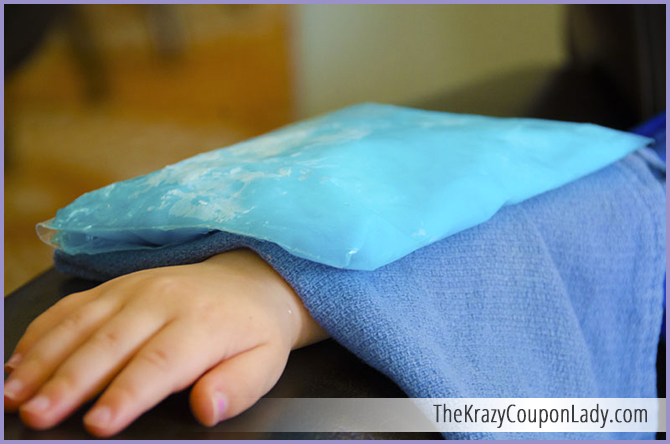 The moist cold of an ice pack or compress is of more benefit than the dry cold produced by an ice bag or ice cap, and the ice pack fits more snugly around the joint. Cover the skin area to be treated with a flannel cloth. Never place ice directly on the skin. Place a layer of crushed ice about one inch thick on a towel or piece of flannel big enough to cover the area completely. Cover this with a second towel and pin in place. Now place the ice pack over the painful area. Pin a piece of plastic or rubber sheet over the compress. Be sure the bed is protected if the treatment is to be given in bed. Leave the pack on for 30 minutes and keep the limb elevated. After the ice pack is removed, dry the skin and keep the area covered with a dry towel or piece of flannel. Repeat this treatment every two hours for a total of 8 to 12 hours or longer if necessary. Make sure that the skin does not freeze. In acute joint sprains, this treatment can be continued for one or two days and then alternate hot and cold may be used, as previously described. If ice is not available, the injured part can be placed in ice water or cold tap water for 30 minutes. This can be repeated every two hours for eight to twelve hours or longer if necessary.